BYOD or Bring Your Own Device is a policy that allows students to bring their own computing devices, such as smartphones, laptops, e-readers, tablets, or other mobile gadgets, to school for use on the school’s network. Sometimes, BYOD is referred to as BYOT or Bring Your Own Technology. This term is used to shift the focus away from the hardware to one that encompasses the range of resources offered by a device. Does our school need Bring Your Own Device? Very few people would debate the educational value of technology upon learning. However, students already have access to school owned technology through mobile carts and scheduled computer lab times throughout the week. A reasonable question to ask is why does our school need BYOD? BYOD shifts the financial responsibility of purchasing and maintaining technology to parents. This results in significant savings from reduced hardware and software costs. In addition, BYOD allows schools to make e-books available to students, which are less expensive then the printed version. This frees up money to be allocated elsewhere within the school. Mobile carts or scheduled computer lab time are restricted to booked time slots. This limits education opportunities. To create an optimal learning environment in all subject areas, students need ongoing access to technology throughout the school day. Budget constraints prevent a school from providing each student with their own device. 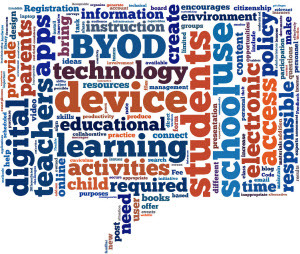 BYOD creates a one device per one student ratio (1:1) that is maintained throughout the school day. The 1:1 ratio produces a student-centered environment that improves learning. Technology is continuously evolving. A school has an inadequate budget to keep up with the pace of change. BYOD is an effective way to ensure that students have a current device. This is important because the majority of jobs today require technology skills. In addition, new career opportunities are constantly developing. Consider that ten years ago the following jobs did not exist: apps developer, professional blogger, social media manager, cloud computing consultant, or search engine optimization specialist. By the time a student graduates from high school there will be even more jobs that are new as a direct result of technology advancements. It is essential students have up-to-date technology to prepare for work in a high-tech, global economy. A school owned device cannot be customized per user. However, different learners have different needs. With BYOD, students can select the device they use for learning based on personal preference. Furthermore, they can customize the settings to make it easier for them to use. This increases their comfort level and confidence. As well, students can install their own applications allowing them to use programs that best suit their needs. This can benefit everyone, but especially English as a Second Language (ESL) and special needs learners, who may require specialty software or custom dictionaries. School owned devices typically do not go home with students. With BYOD, the gadget belongs to the students, allowing them to take it anywhere. This extends learning beyond the walls of the classroom. In some schools, everyone uses the same device. This can create a situation whereby everyone does everything the same way. However, with BYOD there are numerous devices. This diversity encourages teachers to incorporate innovative teaching practices, instructional materials, activities, assessment tools, and communication methods. When students have their own device, it makes it possible for teachers to integrate the use of digital instructional materials into learning more frequently. For example, they can increase their use of e-books, online content, video, drill and practice games, simulations and more to teach concepts. This improves the relevance, timeliness, and interest in curriculum. BYOD gives each student the capacity to communicate with parents, teachers, administrators, peers, community members, industry experts, and others using email, chat, blogs, and other technology throughout the school day. Improved communication enhances learning. Ongoing access to technology throughout the school day transforms the classroom into a student-centered environment. This promotes innovative teaching practice and access to digital instructional materials that improve learning. BYOD can increase students’ ability to collaborate, transfer learning, work independently, be responsible, use technology competently, apply higher order thinking skills, express creativity, and act as digital citizens. These skills are all necessary to thrive in the 21st century.